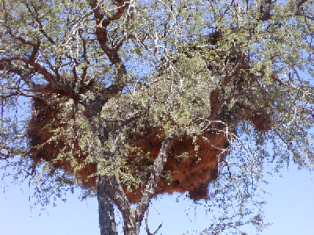 PHOWN (Photos of Weaver Nests) is a monitoring project to study breeding distributions and colony size variation in weavers. All records of weaver nests are welcome but sometimes participants come across so many colonies they are not sure where to start. Here are a few priorities that you may choose to focus on. Sociable Weavers are restricted to arid areas in southern Africa, largely due to their nests [see more here under 2010-06-29]. They may thus be affected by climate change in the years and decades to come. To see if their breeding range is changing, you can record the first nest when driving into its range. Ideally we would like 'first occurence' records along all roads and in every year. The Sociable Weaver has not changed its southern-most limit in 21 years (see here) but what about other areas? There appears to be a range exapnsion in Botswana when travelling when Namibia - see map of all PHOWN records here. The Thick-billed Weaver expanded its range to Gauteng in the 1960s and in recent years seems to be expanding its range outwards from Gauteng. An interesting study would be to compare colony sizes of this species at the edge of its expanding range with those in the core of its range. Send in as many PHOWN records from anywhere in Gauteng as possible, as well as by finding colonies anywhere near its range edge. To read more about its changing range, see here and to see a map of PHOWN records see here. The Southern Masked Weaver is a common breeding resident through most of southern Africa, and is the most common weaver species in most places, a notable exception being the tropical eastern coast of southern Africa. There, however, appears to be a clear difference in colony size geographically. In arid areas colonies may be small, but are often large, where several males build in a colony near clumped resources of food, water and nesting material. In more mesic areas, and especially in urban or semi-urban areas, where food and water are available through the year, this species usually breeds in single-male colonies (rarely more males). A summary of this geographic variation was presented at the Arid Zone Ecology Forum in 2011, see here, based on the many PHOWN records for this species, see here, but many more records are needed from different areas. The Village Weaver has one of the widest distributions of weavers in Africa, although its range is limited in southern Africa. This species is ideal to study colony variation on a continental scale, especially as this species is fairly common and nests are fairly easy to find within its range. Counting the nests of Village Weaver requires a little effort - their colonies are often large with up to a few hundred nests. 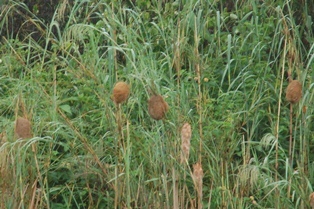 To count the nests, it is best to walk around the colony and take about 3 counts and then use the average. It is helpful to use binoculars and stand a few metres away from the colony. PHOWN records for Village Weaver may be viewed here. 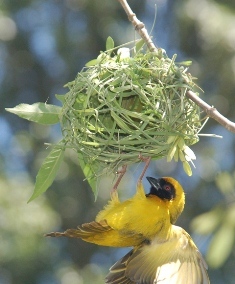 Other than the Village Weaver, one of the most common weavers along the eastern coast of Africa is the Yellow Weaver (known as the Golden Weaver in East Africa). 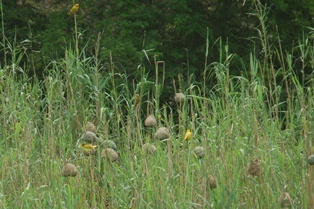 Counting the nests of this species requires a little effort - Yellow Weaver colonies are often in reeds where nests may be obscured from view. One option is to use chest waders (from a fishermans shop) and carefully walk through the reeds (without damaging reeds with nests) to count the nests. For some colonies you may be able to find an elevated view (eg high river bank) from which you can look down on the reeds and count the nests. 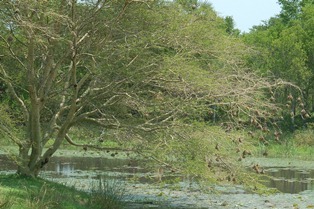 Some colonies are in trees - to count these, see under Village weaver above. PHOWN records for Yellow Weaver may be viewed here. If you only have time to record a few colonies in an area where there are a large number of weaver colonies, then try this. The most useful is to record all weaver colonies in one area, no matter how small the area is. Eg all the colonies around a farm house, along a short stretch of river, or along a few kms of a road. You can define any area, as you would for MyBirdPatch, and record all the weaver colonies to allow density calculations. An example is counting all the Cape Weaver colonies on Robben Island - see here. Of course, all PHOWN records are valuable and records for species not yet covered are exciting to see!